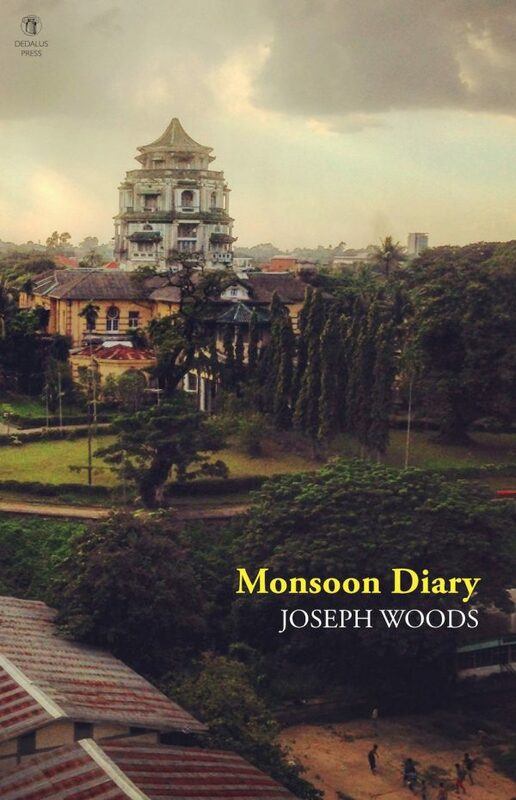 For me, there’s a certain serendipity to the book cover of Monsoon Diary. Last December Pat Boran was in touch about the book and ideas for the cover, as a precursor to knuckling down to the text and its arrangement. I was clear about one thing; given the book’s context, I wanted a contemporary photo, something urban, downtown Yangon and rain-drenched as befits the testing monsoon. I was convinced I had taken the right image, but a search through my own photos didn’t quite reveal what I wanted and so we played around with a few images including one, sourced by Pat, of a rain-splattered windscreen with people obscured and crossing a road. We were getting close and agreed we wanted to avoid touristic golden temples and pagodas. But given that Myanmar, or Burma, in literature is known as ‘The Golden Land’, I did want yellow in the cover or a ‘Yellow Book’ of sorts? It’s also, simply, my favourite colour. I approached a few photographers with a request, ‘urban and in the rain’, but got no real takers, until I contacted a pal in Yangon, Shane Brady, an Irish Yangonophile who often accompanied me on bookshop searches in the city and was already a dedicatee of one of the poems, ‘Sundays in Rangoon’, in the book. I was clear about one thing; given the book’s context, I wanted a contemporary photo, something urban, downtown Yangon and rain-drenched as befits the testing monsoon. He bounced back immediately with an iPhone picture he’d taken of the Chin Tsong Palace with monsoon clouds heaving and swirling above it. I knew we had the image and atmosphere, especially since the building had intrigued me for virtually all my time in Yangon. For our first year in Yangon, my family lived in a neighbourhood more densely populated than Dacca which was not ideal for rearing a toddler, but a half-crown of sonnets, Let us fly away to the famed cities of Asia, arose from that experience. In our second year, we moved to Golden Valley, a neighbourhood behind the Chin Tsong Palace, and from the back of our house we could see its tiered tower. Golden Valley was the traditional neighbourhood for colonials, and during Myanmar’s long stagnation and isolation, for retired military colonels – and now, expatriates with families. I tried getting into the grounds of the palace on a few occasions but was politely turned away at the entrance by a guard, until one day I brought my daughter in her stroller and no one seemed to mind. After numerous visits to the grounds, one afternoon, knowing that in Burma it’s better to ask for forgiveness than for permission, I left the stroller outside the palace and we walked in. I had my camera and we explored the elaborately carved teak stairs and I photographed the once fabled, now empty and sadly dilapidated interior. There were murals of Chinese scenes that are incongruously the work of imported English artists, Ernest and Dod Procter who went on to better things. After numerous visits to the grounds, one afternoon, knowing that in Burma it’s better to ask for forgiveness than for permission, I left the stroller outside the palace and we walked in. The palace was the project of its eponymous owner Lim Chin Tsong, a fabulously wealthy Chinese merchant who intended it as a lavish residence. Work began in 1917 and was only completed in 1920, so we are in the midst of its centenary. Within a year of its completion, Lim Chin Tsong’s fortune had folded and he was broke for the few years before his death in 1923. The building has had many different fortunes since, as a hotel, a broadcasting house for the occupying Japanese forces, and now houses, rather half-heartedly, a school for the Fine Arts. And there’s a further serendipity, the great Irish chronicler of Burma, Maurice Collis (whose life I’ve been pursuing and writing), once stayed here on his return to Burma in 1937, to write a travel book, Lords of the Sunset. He recounts reaching ‘The House on the Island’ by sampan or boat and is even photographed in the ‘Island Garden’ grounds in the book. This suggests that either the nearby (to the right of the photo) Kandawgyi Lake must have once extended around the palace, or, more likely, the grounds of the palace once extended to the lake shore. Occasionally, while living in Golden Valley, I took a 6 a.m. constitutional by that lake, and walking behind the palace I’d sometimes see the rising sun spilling through the top storey, which, while empty, must remain one of the most coveted 360-degree views over Yangon. I was delighted, too, that Shane in his picture had captured in the foreground a game of chinlon, a kind of kickboxing version of volleyball played with bare feet and a hard rattan ball. That game and the curious colour tints added to what Pat rightly pointed out was a Hieronymus Bosch effect. As for that yellow cover? Well, the book’s title is in imperial yellow.